Referrals from JobCentre Plus, Social Services and other agencies. 40 to 60 people access the food bank weekly. It is supported primarily by the congregation, plus Asda - Heath Town, Sainsburys - Bentley Bridge, Tesco Community Food Connection (Wolverhampton) - via FareShare, St Stephens Primary School and Holy Trinity Church. Offering a range of activities that promote physical wellbeing and emotional resilience through positive engagement within the community, primarily with parents, carers and young people aged between 10-16 years old. Serving approximately 200 cups of soup every fortnight to students, parents and local residents. A three course meal is also offered to those in need. This initiative has received support from the local Police, the Lord Mayor of Wolverhampton and the MP for Wolverhampton North East. A community iniative providing services for senior citizens who meet monthly. Examples of training opportunities include: Safeguarding, Prison Chaplains, Children and Youth Workers, etc. Free lunch every Christmas Day. Attended by homeless people and those new to the area. Free barbeque and family fun day every August Bank Holiday. Free Finance Management Course delivered by members of the church. 1. Church Building, 173 Wednesfield Road, WV10 0EN. The focal point for church services, meetings and social events. The congregation has outgrown the 275 seat capacity of this building. 2. New Trust Centre, 1 Wolverhampton Road, WV10 0PD. Currently used to deliver community programmes, training and for social gatherings. Hallmarket Turf Machinery Ltd, 32/39 Woden Road, WV10 0AU. 1. Reconfigure 173 Wednesfield Road for use by community organis ations and stakeholders. 2. Erect a new 550-seater Worship Hall and Heritage Centre with modern facilities in front of the existing New Trust Centre. 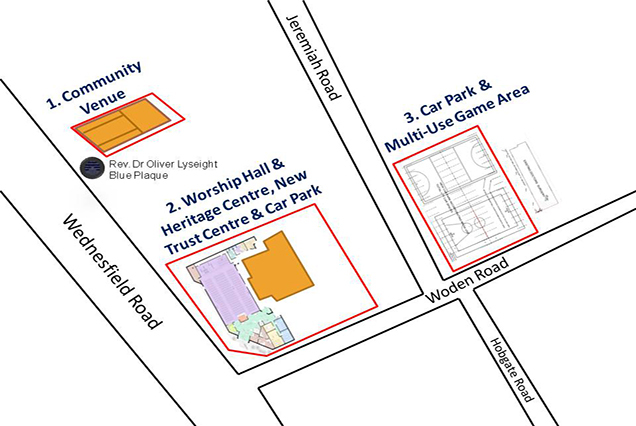 The Centre with 41 car park spaces will be retained and its community and training programmes expanded. 3. Demolish and clear the factory site to form a new 70 space car park and multi-use game area (MUGA) with football and basketball pitches. Based on professional advice and guidance, the total project costs are estimated at £1.7 million. Harvest Temple aims to raise £1 million through its own fundraising. This leaves £0.7 million to complete the project. It is our intention to commence this project November 2017 and complete it by the end of 2018. Please consider contributing to this exciting development at Harvest Temple. We would welcome your donations, which can be made online by visiting https://mydonate.bt.com/charities/harvesttemple and selecting ‘Donate Now’. Click here if you would like to send a regular donation by standing order. 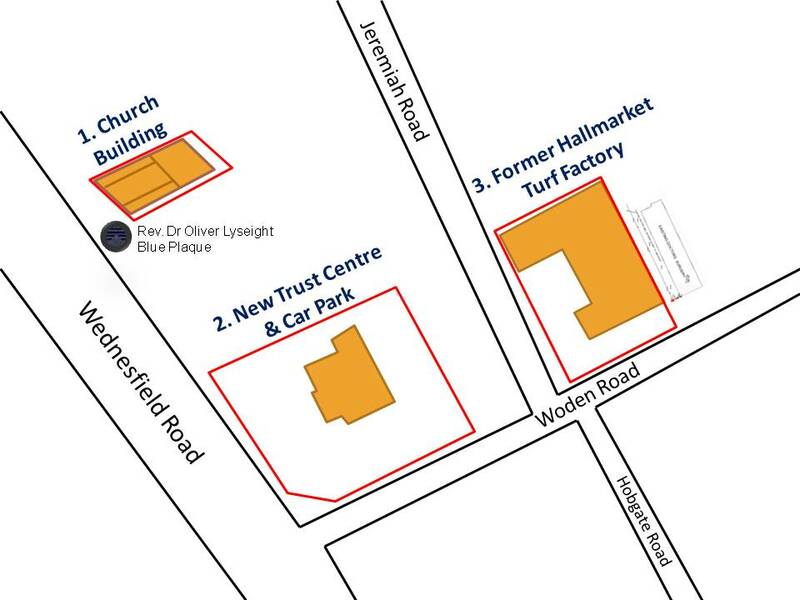 NTCG Harvest Temple, 173 Wednesfield Road, Heath Town, Wolverhampton, WV10 0EN, England. If you are a UK taxpayer, you can Gift Aid your donation and increase its value by 25% because NTCG Harvest Temple can reclaim the basic rate of tax on your gift at no extra cost to you. Remember NTCG Harvest Temple in your will. Click here to find out more.